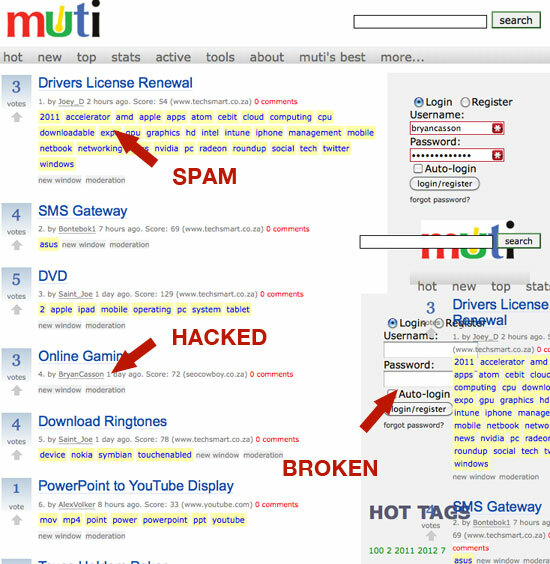 It is sad to see one of South Africa’s top aggregator websites muti.co.za comes to an end after appearing to be hacked. Users of Muti are now greeted with a broken Muti screen when trying to log in to their accounts. Once attempting to log in to Muti, it seems that the passwords and other sensitive information is then sent to a hacker as a few minutes after trying to log in a post was made under my name leading to some spam website. Other accounts have also been compromised by this, with posts also leading to common spam destinations. Every post in the last month has been only spam so I am guessing that Muti lost control of their site close to this time. My question is why does Muti not just take their site down rather than letting spammers have free reign on what once was a fantastic aggregator? It has been a slow decline for Muti over the past year as it a turn for the worse a few months ago as spammers seemed to take over and good content was lost in the woodwork. Aggregators in South Africa seem to be dropping like flies but at least the good news is that myScoop is still going strong and seems to have put some good spam protection in place. I do hope that other SA aggregator websites are created as there seems to be no competition for myScoop at the moment. Over the years i’ve had many websites hacked, and totally hate having to restore databases and files because some idiot tries to prove that his not an idiot. Honestly these hacker dudes must die.